The range-searching problems that allow efficient partition trees are characterized as those defined by range spaces of finite Vapnik-Chervonenkis dimension. More generally, these problems are shown to be the only ones that admit linear-size solutions with sublinear query time in the arithmetic model. The proof rests on a characterization of spanning trees with a low stabbing number. We use probabilistic arguments to treat the general case, but we are able to use geometric techniques to handle the most common range-searching problems, such as simplex and spherical range search. We prove that any set ofn points inE d admits a spanning tree which cannot be cut by any hyperplane (or hypersphere) through more than roughlyn 1−1/d edges. This result yields quasi-optimal solutions to simplex range searching in the arithmetic model of computation. We also look at polygon, disk, and tetrahedron range searching on a random access machine. Givenn points inE2, we derive a data structure of sizeO(n logn) for counting how many points fall inside a query convexk-gon (for arbitrary values ofk). The query time isO(√kn logn). Ifk is fixed once and for all (as in triangular range searching), then the storage requirement drops toO(n). We also describe anO(n logn)-size data structure for counting how many points fall inside a query circle inO(√n log2n) query time. Finally, we present anO(n logn)-size data structure for counting how many points fall inside a query tetrahedron in 3-space inO(n2/3 log2n) query time. All the algorithms are optimal within polylogarithmic factors. In all cases, the preprocessing can be done in polynomial time. Furthermore, the algorithms can also handle reporting within the same complexity (adding the size of the output as a linear term to the query time). Portions of this work have appeared in preliminary form in “Partition trees for triangle counting and other range searching problems” (E. Welzl),Proc. 4th Ann. ACM Symp. Comput. Geom. 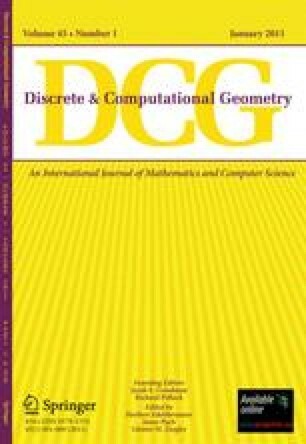 (1988), 23–33, and “Tight Bounds on the Stabbing Number of Spanning Trees in Euclidean Space” (B. Chazelle), Comput. Sci. Techn. Rep. No. CS-TR-155-88, Princeton University, 1988. Bernard Chazelle acknowledges the National Science Foundation for supporting this research in part under Grant CCR-8700917. Emo Welzl acknowledges the Deutsche Forschungsgemeinschaft for supporting this research in part under Grant We 1265/1-1.